ORT JTAG is a advanced JTAG Programmer / Multibrand JTAG Tool lets you to work with the wide range of devices with the JTAG interface and the main intended purpose of the ORT JTAG is repairing / recovering dead boot of the devices such as mobile phones , smart phones , modems , and other electronic devices where you can access through JTAG interface . You can find any device’s pinout with JTAG port available with JTAG Finder in only few minutes . suports ISP operations enables users to directly recover the complete data without removing the chip ( eMMC , eMCP ,etc.. ) That being said it is a a new universal high-speed eMMC device programmer designed for low-level operations and intended for professionals. 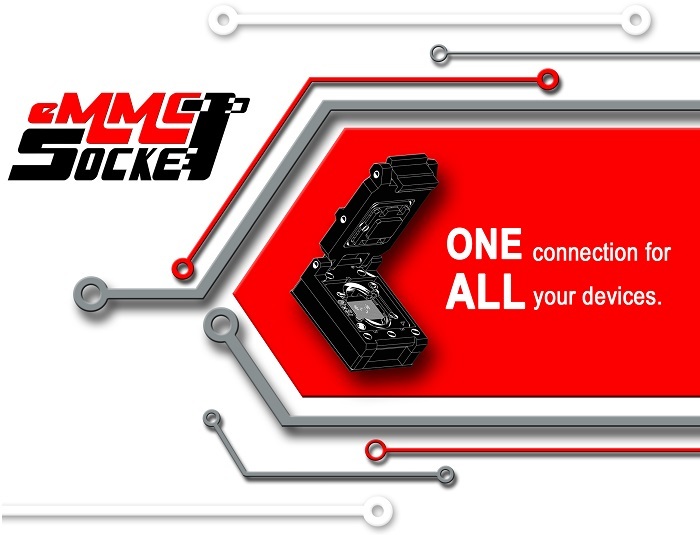 eMMC Socket Provides precise connectivity between your eMMC Box Hardware and eMMC IC’s allows you to read and write eMMC Chips with Chip-off method eMMC Socket is final product of long years of research and development and engineered for the best experience with best performance . © 2017 GSMFABRICA CO LIMITED ( HONGKONG ) 深圳市吉瑞克贸易有限公司. All rights in these trademarks, logos and other marks are the exclusive property of their respective owners.